Those that are acquainted with the current situation in Slovenia, know that we currently have two major protest venues. Maribor, who started it all, and whose protesters have already succeeded in persuading their mayor Franc Kangler to step down (and they aren't stopping there), and Ljubljana, whose activists are protesting more against the Slovenian right-winged government lead by Janez Janša, and no so much against the capital's mayor. You should know that Ljubljana's mayor Zoran Janković is an interesting person, one of those guys that's a bit shady, but since he has done so much for the development of the city, the general public still likes him (but not for much longer it seems). In a similar fashion as the other protests (who are currently happening on a weekly basis), there was one protest in Ljubljana organized using Facebook and other social media channels, targeted specifically against the mayor. This event had hidden attendees, and their wall was covered with posts such as "10.000 confirmed guests", "15.000 confirmed guests" etc. There were a few of us that laughed at this, but this didn't stop the radio and television from reporting an expected record amount of protesters on that day, based solely on that Facebook event's wall posts! The result: a few hundred people, and some of them had a transparent "Thief, we love you". The cached version of the event against Zoran Janković - with 15k hidden attendees. The event is no longer available. Spotted by @loudandwicked. Today, another interesting thing has happened, and we still need to see how it will turn out. The national Commission for the Prevention of Corruption released a report saying both prime minister Janez Janša and Ljubljana's mayor Zoran Janković have more money that they were supposed to have (in hundred thousand euros). 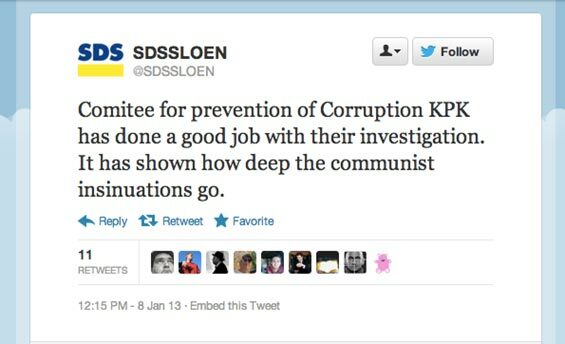 When this happened, Janša's SDS party's parody Twitter account with 30 followers at that time tweeted that this report proved the commission has finally dug into the corrupt communist hole. The tweet that got mistaken for an official statement. When I saw this tweet, I instantly checked the profile, since the tweet seemed very unbelievable, concerning the fact their leader is also inside the report. I instantly knew it's a bogus account, but this didn't prevent the Slovenian Press Agency from putting this tweet as a quote inside one of their news (no longer available), and from there on it was instantly picked up by other media as well. We are talking about one of the most important Slovenian news sources! The citation of the tweet, copied by demokracija.si from STA. Spotted by @miharejc, amplified by @multikultivator, read the the thread. There are probably more cases like this, and it needs to stop! Social media is a wonderful tool for providing additional information about something specific, but as we've seen in the two cases, it often can't be the primary source for the news. Journalism needs to go a step back, and provide credible information from trustworthy sources. Otherwise, there won't be much truth left for our descendants, since too many people will simply have the power to make things up. But everything's not bad - situations like this could provide clear distinction between real journalists with original sources, and those who do nothing else but copy others. Something we critically need in this age of data abundance.